You may have seen a kid play with a feather, or you may have played with one yourself: Running a hand along a feather's barbs and watching as the feather unzips and zips, seeming to miraculously pull itself back together. That "magical" zipping mechanism could provide a model for new adhesives and new aerospace materials, according to engineers at the University of California San Diego. They detail their findings in the Jan. 16 issue of Science Advances in a paper titled "Scaling of bird wings and feathers for efficient flight." 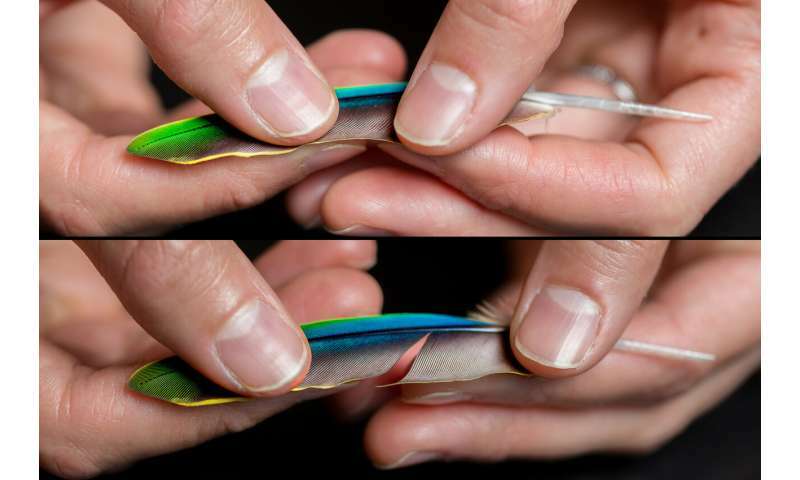 Researcher Tarah Sullivan, who earned a Ph.D. in materials science from the Jacobs School of Engineering at UC San Diego, is the first in about two decades to take a detailed look at the general structure of bird feathers (without focusing on a specific species). She 3-D-printed structures that mimic the feathers' vanes, barbs and barbules to better understand their properties—for example, how the underside of a feather can capture air for lift, while the top of the feather can block air out when gravity needs to take over. Sullivan found that barbules— the smaller, hook-like structures that connect feather barbs— are spaced within 8 to 16 micrometers of one another in all birds, from the hummingbird to the condor. This suggests that the spacing is an important property for flight. "The first time I saw feather barbules under the microscope I was in awe of their design: intricate, beautiful and functional," she said. "As we studied feathers across many species it was amazing to find that despite the enormous differences in size of birds, barbules spacing was constant." 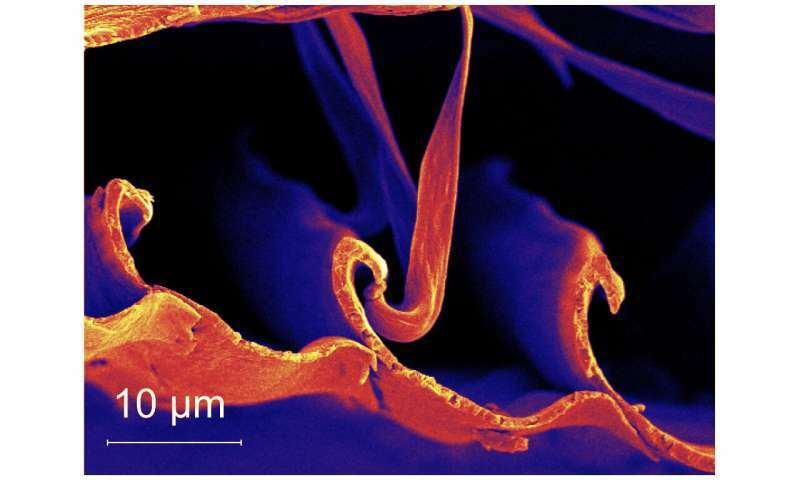 Sullivan believes studying the vane-barb-barbule structure further could lead to the development of new materials for aerospace applications, and to new adhesives—think Velcro and its barbs. She built prototypes to prove her point, which she will discuss in a follow up paper. 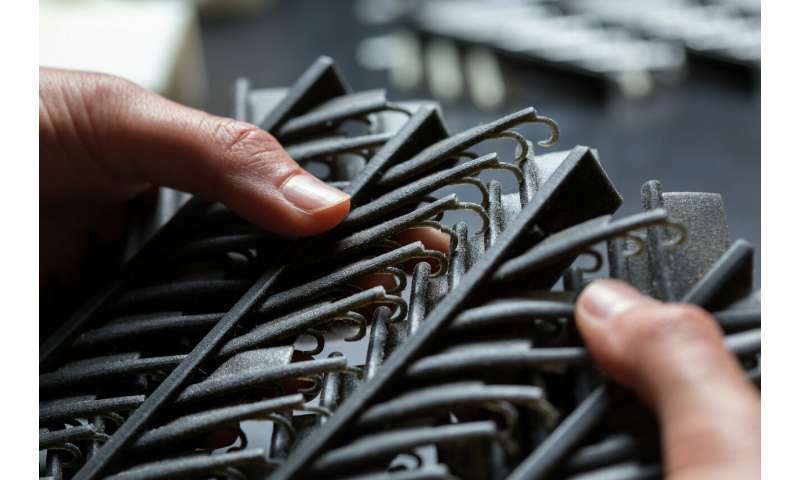 "We believe that these structures could serve as inspiration for an interlocking one-directional adhesive or a material with directionally tailored permeability," she said. his is known as allometry—the growth of certain parts of body at different rates than the body as a whole. The human brain is allometric: in children, it grows much faster than the rest of the body. By contrast, the human heart grows proportionally to the rest of the body—researchers call this isometry. "Professor Eduard Arzt, our co-author from Saarland University in Germany, is an amateur pilot and became fascinated by the 'bird wing' problem. Together, we started doing allometric analyses on them and result is fascinating," said Meyers. "This shows that the synergy of scientists from different backgrounds can produce wonderful new understanding."